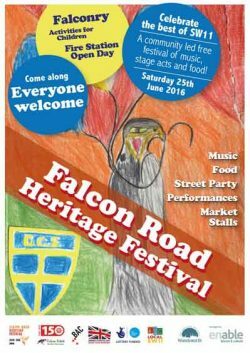 The Falcon Road Heritage Festival on Saturday (June 25) will feature a day of family entertainment to celebrate the local community and pay tribute to Armed Forces Day. The free festival includes music, entertainment and food. In the afternoon there will be a marching ceremony and the Mayor of Wandsworth, Cllr Richard Field, will lead the tributes to the armed forces. There will also be open days at Battersea Fire Station and Christchurch School to mark the 150th anniversary of both. Local Reserve armed forces and reserves and cadets will be taking part throughout the day and the National Army Museum will present an exhibition and activities celebrating the service of Commonwealth and Empire Soldiers in WWI. The event has been organised by Battersea Fire Station, Big Local SW11, Christchurch School, Sacred Heart School, Falcon Estate Residents Association, Providence House, Kambala Residents Association and Falcon Road shops and has been supported by the Enable Events Team on behalf of Wandsworth Council. Motorists should be aware that parts of the following roads will be closed: Este Road, Batten Streets, Fownes Street and Coppock Close. See more at www.wandsworth.gov.uk/roadworks.